We were able to help Alex find his elephant, but we still have a mailing list for the various Animal Grabbers. 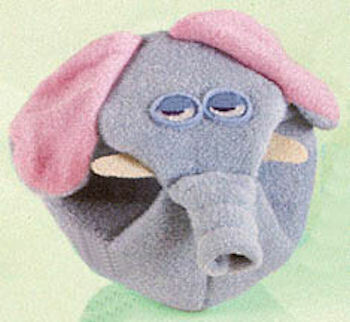 I’m looking for Ellery the Elephant, an Animal Grabber made by Fisher Price from 1979 – 1986 that’s about 4 inches across. It’s an easy to grip blue terry elephant that rattles when shaken. The elephant head is shaped a bit like a ball with a loop through the middle for baby to hold it. It has a long blue trunk that is sewn to his bottom lip forming a loop with pink terry-cloth ears, sleepy blue stitched eyes, and white tusks on the sides of his trunk. My brother has had this plush toy since he was born. He lent it to our younger cousin when he was born. When he was returned, it wasn’t in ideal condition. I’ve been scouring the internet for a new one for his upcoming birthday. I am willing to pay a premium! I’m also looking for this. I too will pay a premium for it. I am looking for the elephant, the pig and the dog. Mostly the pig… any word out there? Anything would be appreciated. A Finder’s fee or the items as well as payment for the items are available. Thank you. Ps Good luck to all above! I’ve been searching for a long time, never gave up. With all the bad things that’s been going on with our family, this truly brightens our day. It will be a big surprise to my brother! Thank you all so much again!!!! ebay #261129068405 elephant low opening bid. Good luck! Are there anymore Ellery’s out there? I too got this as a gift for my first birthday and lost it when the family moved. Been looking for years, want to give it to my own daughter now who is two months old. Thanks! !